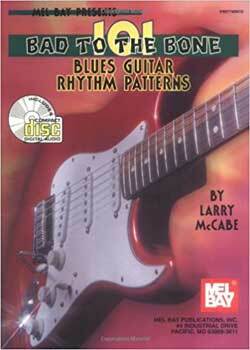 Larry McCabe 101 Bad to the Bone Blues Guitar Rhythm Patterns PDF + Mp3 CD download. Larry McCabe teaches you to play authentic four and eight-beat blues guitar backup rhythms recorded like the pros. The companion CD contains all blues rhythms recorded exactly as they appear in the book – each based on the C7 chord or on the Cm chord. For ease of learning, most of the patterns are played at a moderate speed. The split-track stereo format permits muting of the rhythm guitar part, facilitating practice with only the bass and drums. Suitable for players at all levels, each four or eight-beat patterns appears in standard notation and tablature. While not recorded on the companion CD, the book also offers typical eight-bar progressions in major keys, and 12-bar blues progressions in various major and minor keys. The book concludes with an appendix entitled “Open Charts for Applications of Patterns”. This section encourages students to apply the 101 patterns in original ways and provides insightful arranging tips. Download Larry McCabe – 101 Bad to the Bone Blues Guitar Rhythm Patterns PDF free and other books from our site. Only high quality PDF scans. Please write a review, it's important for our community.